Fitz Fulton was born on June 6, 1925, in Blakely, Georgia. He enlisted in the Aviation Cadet Program of the Army Air Forces on April 9, 1943, and was commissioned a 2Lt and awarded his pilot wings on December 23, 1944. Fulton served as a transport pilot and B-29 Superfortress co-pilot in the United States during World War II, and he served at Roswell AFB (later renamed Walker AFB), New Mexico, from November 1945 to September 1948. Fulton then served as a pilot in the Berlin Airlift from September 1948 to October 1949, before serving as a test pilot at Eglin AFB, Florida, from October 1949 to January 1950. He then served as a test pilot at Edwards AFB, California, from January 1950 to June 1951, when he went through combat crew training in the B-26 Invader. After training, Fulton was assigned to the 13th Bomb Squadron of the 3rd Bomb Group during the Korean War, where he flew 55 combat missions between September 1951 and April 1952. He then resumed his test pilot duties at Edwards AFB, and completed Test Pilot School in November 1952. Fulton served as a test pilot at Edwards AFB continuously from April 1952 until his retirement from the Air Force on July 31, 1966. During his time as an Air Force test pilot, Fulton flew in the B-58 Hustler, YB-60, and XB-70 Valkyrie test programs. 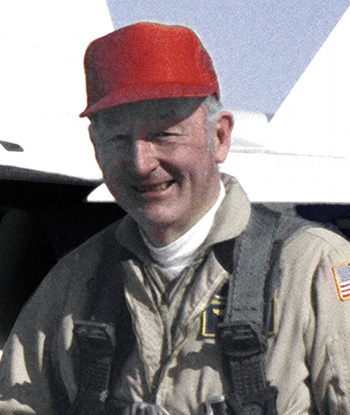 Following his retirement from the Air Force, Fulton went to work as a test pilot with NASA's Dryden Flight Research Center at Edwards AFB, where he flew NASA's B-52 launch aircraft in the X-15 and lifting body research programs, NASA's XB-70 research program, the YF-12 research program, the 747 Shuttle Carrier Aircraft tests, where the Space Shuttle Enterprise was launched from a Boeing 747 in flight, and numerous other flight test projects. He retired from NASA on July 3, 1986, with over 15,000 flying hours in more than 200 types of aircraft. Fulton was the recipient of the Harmon International Aviation Trophy in 1962 for his work on the B-58 Hustler program. After retiring from NASA, he joined Scaled Composites as director of flight operations and chief research pilot. Fitz Fulton died on February 4, 2015. On the night of 14 October 1951, Captain FITZHUGH L. FULTON distinguished himself by extraordinary achievement while in aerial flight as pilot of a B-26 attack bomber over enemy-held territory in Korea. Performing armed reconnaissance over vital Communist supply routes, Captain FULTON sighted a moving train. Despite accurate anti-aircraft fire which inflicted four holes in his aircraft, he attacked his target with repeated low-level bombing and strafing runs. After exploding the locomotive he continued his assault until he had destroyed five boxcars and probably destroyed eleven additional cars. 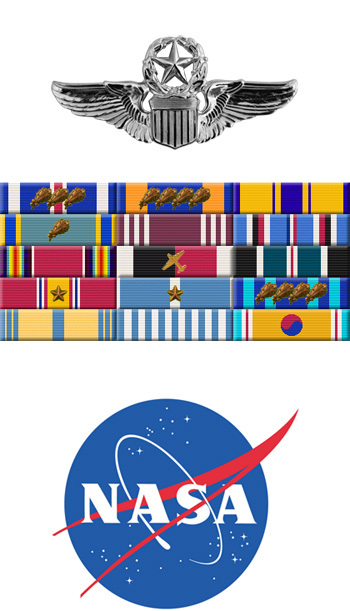 In this unusually effective strike the enemy's supply system was seriously disrupted and Captain FULTON reflected great credit upon himself, his organization and the United States Air Force. 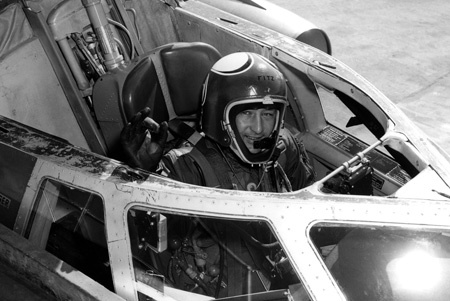 Fitz Fulton in the cockpit of a B-58 Hustler during testing.